For over many years bloggers and website owners use SEM Technique to popularize their blog and grow business. In today’s time it’s really important to understand each and every way which make your blog or website grow to heights. SEM is the best way to that as the name get its clear that it is for promoting your blog on Search engine due to which it will get high and good rank in SERP’s ( Search Engine Result Page). Till now many of the blogger are not aware of the term SERP right. It Stand for Search Engine Result Page. This is the page where you can show you website or blog link for a given cost as per the rating. 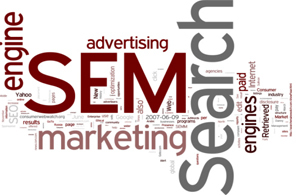 SEM is a totally Paid Service. Getting an over view of some of the methods used to optimize your blog through SEM. In today’s time competition is so tough in between many bloggers and website owners. So, its important to stay ahead of every blogger. Doing a Keyword Research before writing any article should be yours top most priority. Saying so, most of the top bloggers have enhance their blogging just by doing a good Keyword research and adding it as per there blogging Niche. Note: Adding Too Much Keywords can cause harm to your blog ranking. The more your site have online presence like face-book share, Google+ share etc the more your site rank will get high in the course of 3 months as Alexa Rank get in 3 months. Saying so, People using SEM have already got a major change in there rank and online presence. The Above info is just some basic info which you already know right! Ok, Here I am telling you that what Really SEM do for your blog or website to grow your business. We use SEO for free optimization of Search engine which will automatically get you more page-views and a good rank without paying any real money. On other hand there is SEM which is a totally paid service and which will automatically get your blog to high rank and put your blog in Search engine which will ensure you best results for you. As I have written that SEM is totally paid this make it less searched by many people as they need free Optimization for your blog. Mostly the big blog or website owners use Search Engine Marketing to get a quick response from the people. There is a big difference between Search engine optimization and search engine marketing is that SEO only optimize your blog as far as you put efforts in making it searchable on search engine whereas SEM as it’s a paid service it take care of every point from which your blog can be showcase and brought up to the ranks for your business. You all be thinking by now that this blog is using SEM for its success but it’s totally not true we only work via SEO optimization. Well benny short but nice article. Helpful for me in coming days. nice best article,well write-up great appreciated work,very useful and informative article thanks for sharing. It's a nice content about SEM.the information you shared was nice but want a more described.otherwise good work on that.Thanks for share this.